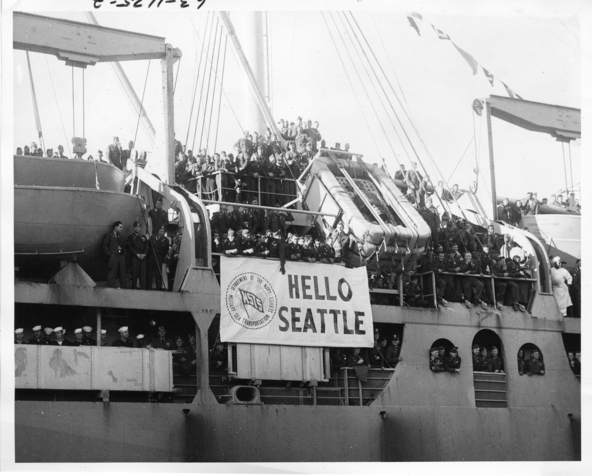 On May 5, 1951, Seattle welcomed 1,500 soldiers back to the US from the war in Korea. It was a raucous celebration with a 105mm Howitzer 19-gun salute, fly-overs by B-29 Superfortresses and F-94 interceptors, fire boats spraying water, and a parade that led them to Fort Lawton. Along the way there was a block from Marion to Madison on Second Avenue where women showered the soldiers with flower blossoms. The soldiers were prepped for the celebrations at Port Angeles. An Army tug delivered dozens of dress uniforms to men wearing only combat fatigues. In his speech, Mayor Devin reminded the crowd that there were many soldiers who would never experience that sight again. 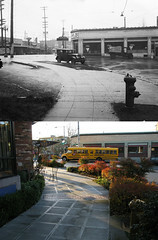 At least 40 Seattle men had already been killed in the war, and that many were still yet to die. The next was Natherene C. Marett. He was originally from South Carolina but moved to Seattle in the waning days of World War 2 to attend the Naval Academy on Bainbridge Island. After enlisting in the Army in 1947 he served in Germany for three years before being transferred to Korea. He is buried at Veterans’ Memorial Cemetery in Evergreen Washelli. I dug up some more details about a man listed as a Seattle resident who had, if any, weak ties to Seattle. I mapped the residences of the men visualized above. It all started when I picked up a set of photos of Elliott Bay, which ended up being just more than a year after this photo. Jack Gordon planned out welcome parades for returning Korean War troop ships, greeting hundreds of thousands of veterans in style. His son is piecing together a website about Jack.